Weather Hill Farm is offering Aware: A Retrospective of the Life and Work of Eric Sloane (Garrigues House, Publishers 2001) in a specialized signed and numbered format as a fundraiser for the Noah Blake Cabin Restoration Fund established by the Friends of the Eric Sloane Museum. You’ll receive your copy of Aware, shipped free via USPS, signed and inscribed to you or a person/persons of your choice, thanking them for supporting the Noah Blake cabin restoration. This special volume will make a wonderful gift, and best of all, 100% of the sales price goes to The Friends of the Eric Sloane Museum, a non-profit organization founded in support of the Eric Sloane Museum of Kent, Connecticut. “Nearly everyone who has an interest in early Americana knows of Eric Sloane’s work. Although best known for his depictions of barns and covered bridges, Eric Sloane was also a successful author, illustrator, anthropologist, meteorologist and historian. A man of tremendous and varied talents, Sloane evolved from an itinerant sign painter to an accomplished artist elected to the National Academy of Arts. Born Everard Jean Hinrichs in 1905, Eric Sloane led a full and intriguing life. He created everything from “cloudscapes” while flying with Wiley Post (Amelia Earhart bought his first one) to over three dozen books on the subject of early America. Eric Sloane is undoubtedly one of the most interesting of twentieth century American painters. 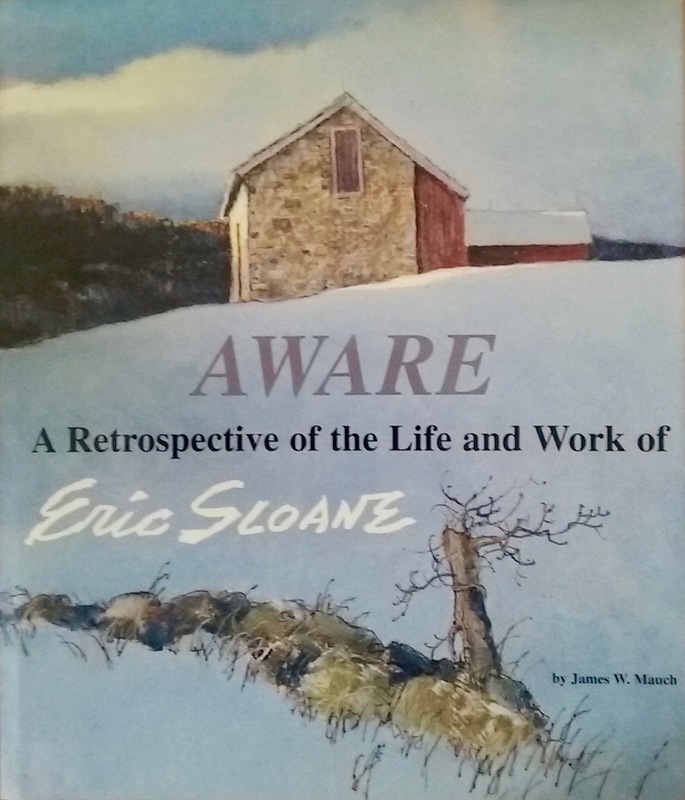 Sure to delight anyone interested in Eric Sloane’s work, Aware is an engaging read, generously supplemented with the artist’s paintings, illustrations and rare family photographs. Two appendices are included…to complete this literary work, the author has included an original, never published Sloane manuscript. Author James Mauch examines each stage of the artist’s career and life, illustrating how one of Sloane’s areas of interest would be a catalyst for the next, a life-long evolutionary process which culminated in a deep exploration of what the artist described as his ‘philosophy of awareness‘“. Includes an original, never-published manuscript of Eric Sloane’s, complete with his corrections. Order Now by calling or emailing the gallery.